I am the unfortunate owner of a GT 245 JD Garden tractor. I paid extra for the 20.5 Kawasaki engine. I also paid for the two year service contract. during the second year of service, The engine went. The dealer did have JD cover the cost of a new engine and installation. from this point on , the tractor never ran right again. Now after two electronic clutches and several other related parts, not to mention a new starter, I'm stuck with a major headache. My feeling is that the Rt. 146 Supply JD dealer in Millbury MA never properly installed the second engine. I was told by the people who installed the first clutch that the bolt that attaches the clutch to the crank shaft had broken off and they needed to drill out the old bolt and re-tap the crank shaft in order to attach the clutch. They seemed to believe that whoever installed the engine may have broken the bolt off inside the crank shaft and never said anything about it. I spent over $6000.00 on this machine brand new not to mention the repairs (over $3500.00). I expected to have a reliable tractor for many years to come. At least that's what I was told by the sales person at 146 Supply. This whole experience combined with the rudeness and arrogance of the JD dealer (146 Supply Co. Millbury MA) have made me realize that JD has problems too. Yes they do! My Dad passed away 10yrs. ago. His John Deere 245 with 14 hp Kawasaki gas engine was bought new and he mowed approx. 3 acres weekly. He bought it in 1993. After mom remarried my step-dad may have used it several times and then it got pushed to the side. Her building getting crowded mom ask me if I wanted it. Why sure,why not. My step-dad and I pulled down to where I live. From there I went on the internet , to look at forums of the possibilties of problems that I may face. First I needed a battery 12v ,had one I had pulled out of an auto 2yrs.ago. Would it charge after sitting 2 yrs. YES-NO COST! !After I changed the oil and filter and checked the spark plug. Bingo it started!!! It's sitting in the building beside my new tractor with the 19.5 hp engine. I must admit JD looks better. Thanks mom!!! I have done business with J D several times. Service staff very poor these days. To bad. Yes absolutely I have to say that the customer service in the store or repair shop tend to be a little rude and unpleasant, but I think it's just the way this small town people are, you know ...the good ol' boy network. If you are not from the country they think of themselves as superior to you... they know their stuff you don't. But my GT 245 I still have it and use. Parents have had one for going on seven years? I now mow for them as they can't take the bumps in the yard so well anymore. They were getting the winterize and spring services every year until last year. Unit still runs fine. Only thing it really needs is to have the blades sharpened. Wonder if there was a change in place of manufacture in the past six years? I've owned my GT245 for six years now. 1st year perfect. Then...I have to replace all belts every year since! I took it to the dealer the second year because I thought it was an alignment issue. They were very rude and stand offish. I replaced the electric clutch the third year. They quickly offer to replace the parts for an extordinary price (they did the second year) but will not offer reasons or a fix to the reason it happens in the first place. I went to a different dealer two hours away and had the same poor customer service (by poor i mean the worst). I will never purchase another John Deer product and strongly advise anyone to avoid them. If you do have a problem, your on your own!! I bought this machine in 2004 paid $6000 and I have been cutting my 3 1/2 acres every two weeks since then and never had a problem other then the ignition which I replaced.I do not know if the later model were built differently. Some models are sold at retailers like home depot or lowes and i would not buy there. I also have a self propelled lawn mower also john deere and that is 9 years old and only had to replace the bag. Well i guess you guys are just out of luck.This happen to me in the past with otherbrands so i switch to john deere and i am happy. MY JOHN DEERE GT245 HAS A BROKEN FRAME. WITH ONLY 300 HOURS.BECAUSE OF THIS IT WILLNOT GO FWD. OR REV. DUE TO THE MISALIGNMENT OF THE FRAME. I CANNOT GET THIS REPAIRED AND OF COURSE THE DEALER DOESNOT KNOW ME. THIS WAS A 5500$ UNIT NEW BUT WORTH NOTHING NOW. DONOT BUY A GT 245! THIS MOWER HAS BEEN NOTHING BUT TROUBLE. FIRST UNLESS THE MOWER WAS RUNNING IT WOULD JUST CHUG ALONG, POOR POWER. WITH THE MOWER GOING IT AL LEAST SOUNDS LIKE IT WORKS. FILTERS HAVE BEEN CHANGED, GAS HAS BEEN CHANGED. SPARK PLUGS HAVE BEEN CHANGED. WHEN WORKED ON BY A DEALER MECHANIC THEY REVE IT UP AND REVE IT UP AND SAY IT IS FIXED AND SAY THAT IT DOESN'T NEED A NEW AIR FILTER, OR CARBUERATOR OR ANYTHING, SO THEY DO NOTHING AND THE MOWER ALSO DOES NOTHING. 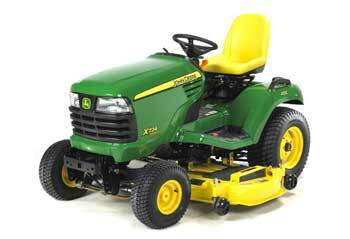 ADVICE: don't buy a GT 245 JOHN DEERE, AND I AM NOT SURE ABOUT ANY OF THE JOHN DEERE GARDEN TRACTORS. NOTHING I DO OR A DEALER DOES MAKES THE LEMON RUN BETTER. IT SPUTTERS, IT WON'T START, IT SPUTTERS, IT LOOSES POWER, AND THE LIST GOES ON AND ON. NEW FILTERS, FRESH GAS, NEW STARTER, NEW SPARK PLUGS, AND THE LIST GOES ON. i WOULD NEVER AGAIN BUY A JOHN DEERE LAWN TRACTOR OR MOWER. GIVE ME A SNAPPER ANY DAY.